Tension was high and Police were on standby when the new Tui Nadi, Ratu Vuniyani Navuniuci, was installed at Narewa Village, Nadi, yesterday. The tension was over how Ratu Vuniyani was installed. In a departure from the traditional protocol, Ratu Vuniyani did not drink the ceremonial bowl of yaqona. Instead, he was ordained with a special oil by his Seventh-day Adventist pastor at Vatulevu Methodist Church, Narewa. On the eve of the installation differences over the way it was to be conducted emerged. A group from Narewa Village disagreed with the scrapping of the yaqona ceremony, saying it was part of the iTaukei protocol that includes the main part, called the ‘Vagunivi ni Turaga’ (installation of chief) Ratu Vuniyani was not accorded the traditional iTaukei protocol of installing a chief, the ‘Vagunivi ni Turaga’. 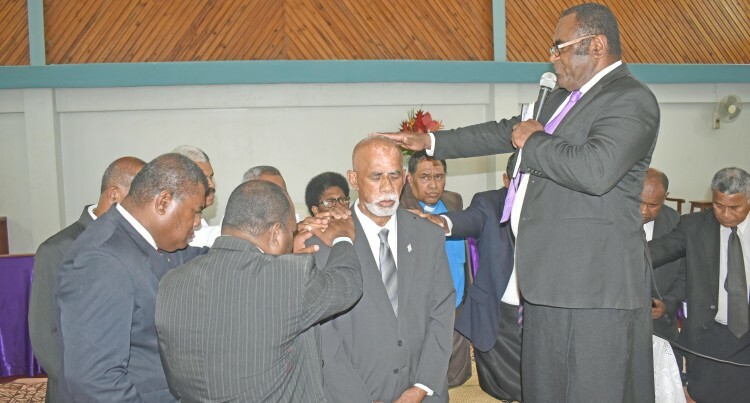 However, it took a different twist when his head was annointed with a special oil by the President of Seventh-day Adventist Church (SDA) of Fiji, Pastor Luke Narube, in front of villagers and members of his church before the altar. Ratu Vuniyani is also a member of the SDA Church of Fiji. Ten villages representing 16 clans in Nadi will come under his reign. “There were differences but I stood on the grounds of the legality of my position that I have been recognised by Government as the rightful holder of this title, there were people in their own interest who were against the annointing,” Ratu Vuniyani said. He added the Police were called in to safeguard the event. “I just want to reconfirm that I am the rightful Tui Nadi and the most senior, I won’t be moved by any other opposition because I am confident with my position,” Ratu Vuniyani said. According to the Bible , the oil by which the kings of old were annointed represented God’s choice of whoever is being annointed and that they are God’s chosen vessel to work through but one must first be in submission to the one who chose them to be where they are. “It is a proud day for me because I am a religious guy and I believe in Jesus Christ, I am proud the pastors from both the Methodist and SDA churches were part of my annointing as Tui Nadi,” Ratu Vuniyani said. He worked for Government in the Ministry of iTaukei Affairs for more than 20 years. Ratu Vuniyani is the 7th person from his family to be installed as the Tui Nadi. “The traditional iTaukei ceremony of installing a chief was not a requirement from the Native Lands Commission, the significant thing is the rightful owner to a title that is listed in the Vola Ni Kawabula (VKB), but it’s the iTaukei villages that follow this tradition,” he said. The letter of confirmation from the Native Land Commission has confirmed that Ratu Vuniyani is the rightful holder of the Tui Nadi from the chiefly clan of Navatulevu in Narewa Village, Nadi. Assistant Roko Tui Ba, Iosefo Rovereivalu said it was unique in the iTaukei culture the way in which the Tui Nadi was installed. “This is the first time that I have seen that a chief is installed without the traditional iTaukei ceremony,” he added. Stewart (Tuirara) Nadi Methodist Division, Taniela Vocevoce who is also from the Navatulevu clan, said that it was first of its kind too. “It was the request from the Tui Nadi that we follow the biblical way of annointing a king rather than the usual iTaukei tradition, this is a new beginning for the village even though some people didn’t like the step taken, and we just conducted the ceremony according to the request from the Tui Nadi,” Mr Vocevoce said. “Even the President of the Methodist in Fiji and Government have shown their support, so we are clean, we cannot go against what he requests because he is the rightful holder of the Tui Nadi, his forefathers and him have invested so much in the development of Narewa, he is a Christian too and we shouldn’t push him away,” he said. Pastor Narube delivered a special sermon with the Bible reading from Chronicles Chapter 2 Verses 1-10. “Being a leader isn’t easy, it is a significant role and people need to be Godly leaders, a leader should always seek wisdom and understanding from God, a close relationship with God is very important,” he said. Pastor Narabe said love was a very important characteristic feature of leadership.